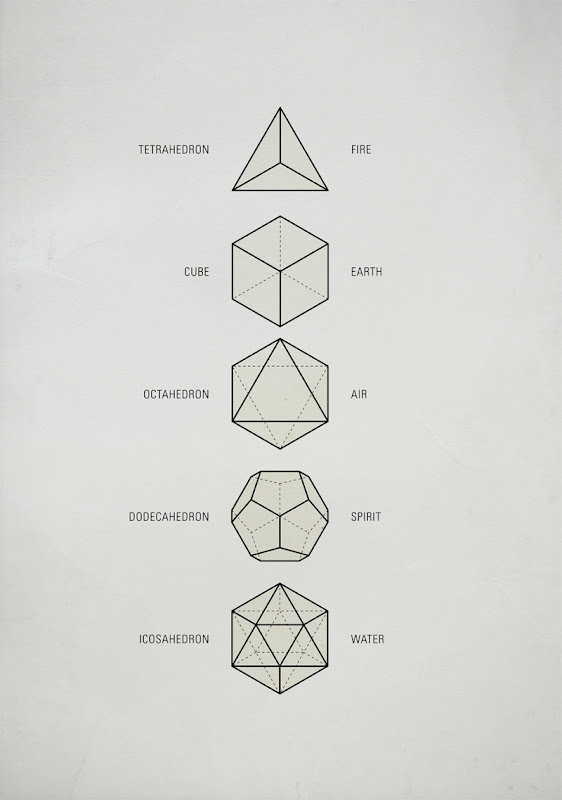 "These five Platonic solids are ideal, primal models of crystal patterns that occur throughout the world of minerals in countless variations. These are the only five regular polyhedra, that is, the only five solids made from the same equilateral, equiangular polygons. They are geometrical forms which are said to act as a template from which all life springs. The aesthetic beauty and symmetry of the Platonic solids have made them a favorite subject of geometers for thousands of years. They are named after the ancient Greek philosopher Plato who theorized that the classical elements were constructed from the regular solids. To the Greeks, these solids symbolized fire, earth, air, spirit (or ether) and water. The Platonic solids are also called "cosmic figures" and are the basic modules for Sacred Geometry. There will be more about Sacred Geometry soon."